(Trent Nelson | The Salt Lake Tribune) Olympus's Rylan Jones and American Fork's Isaac Johnson as American Fork hosts Olympus in the Utah Elite Eight tournament, Saturday December 9, 2017. American Fork • The interest in Isaac Johnson started early. After a showing at a California basketball camp in the summer after eighth grade — a performance he dubbed as unremarkable — he was pulled aside by a Utah State assistant basketball coach and offered a scholarship. Before that moment, Johnson never thought he would become an elite basketball player. “Then it just kind of dawned on me that I can actually be pretty good,” Johnson said. Now a senior at American Fork High School, Johnson’s tone and goals have shifted. He’s serious about a career in basketball, and further cemented that trajectory when he signed a national letter of intent with Oregon two weeks ago. Johnson — a four-star recruit and the No. 1-ranked player in the state, per 247 Sports — comes from a basketball family in the true sense of the phrase. His father, Darren, played collegiately at USU. His mother, Emily, received a scholarship to play collegiately, but decided against attending that school and instead chose to focus on her studies. Johnson’s brother, Spencer, currently plays at Weber State. His oldest brother, Alex, received on offer to play at Dixie State, but declined. Even his younger sister, Gracie, is turning into quite the hooper. But when Johnson was younger, he actually disliked basketball because he felt outside pressure to play. He had so much disdain for the sport that he “hated” it. “I felt like people around me were pushing me because I was tall,” Johnson said. So Johnson tried his long frame at baseball. That lasted a year, and he eventually fell in love with basketball and joined an AAU team in the summer between the seventh and eighth grade. Johnson grew up in a small town in eastern Oregon, where he lived until third grade. From there, his family moved to Germany for two years, then returned to Oregon and lived in Roseburg, a city about an hour and a half south of Eugene. Johnson’s family moved to Utah in 2013, just before he joined the AAU circuit. Johnson, who at 6-foot-11 is so tall he ducks underneath door thresholds and occasionally hits his head in various parts of his home, was recruited to Oregon as a power forward. On some recruiting websites, his true height isn’t listed because he does not want to be pigeonholed as a center. Growing up, Johnson’s parents had him play point guard so he could get used to handling the ball. As he grew, Johnson developed his post skills. He likens his game to that of NBA stars like Kristaps Porzingis, Kevin Durant and Giannis Antetokounmpo. Now the Ducks will be the beneficiaries of Johnson’s versatility. Johnson said he whittled down from 13 schools during the recruiting process, and his top four were Utah, Brigham Young University, Ohio State and Oregon. Johnson took official visits to all but BYU, he said. When it came down it, both Utah and Oregon possessed coaches and atmospheres to which he connected. But Oregon had something special. “I feel like Oregon was my place,” Johnson said. Telling Utah he was signing elsewhere was difficult for Johnson, who forged close relationships with Ute coaches during his recruiting process. Due to NCAA rules, neither he nor anyone else from his family was allowed to contact other schools for more than a hello, which made deciding against Utah all the more painful. 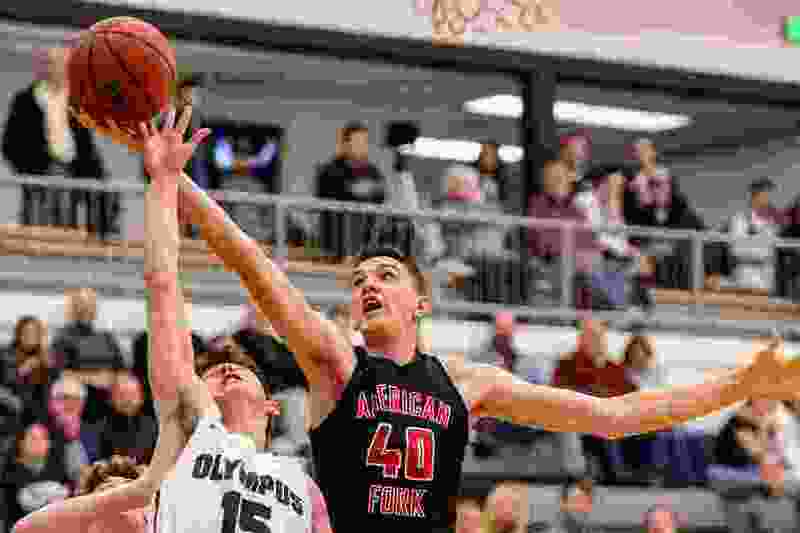 Now that his decision has been made, Johnson can focus on his upcoming senior season with American Fork. He said he wanted to sign with a university early so as not to be distracted during his high school season. He said he was relieved when he made his choice. “It felt like I could kind of breathe again,” Johnson said. After his senior season is over, Johnson will embark on a two-year mission for the The Church of Jesus Christ of Latter-day Saints, and join Oregon as a 21-year-old freshman in 2021. He said Oregon and other schools recruiting him knew of his mission plans, and the support Oregon gave him made it that much easier to choose the school that represents a return to his roots.